It's that time of year again… The time when everyone has a New Year's Resolution to start a new diet or workout on a regular basis or, if you're like me, eat fewer Double-Doubles at In-N-Out Burger. I think the New Year is also a great time to make some new financial resolutions. One simple investment you can make for your future is to open a traditional IRA. Let me tell you how opening an IRA would be one of the best New Year's Resolutions you've ever made. First of all, when you contribute to a traditional IRA, your contribution is exempt from income tax for that year. For example, if you earn $56,000 and you contribute $6,000 to an IRA, you will only have to pay taxes on $50,000 of income. Let's assume you are in the 25% tax bracket. By investing $6,000 in the IRA, you would be saving $1,500 (6,000 x 25%). Your $6,000 contribution to your IRA would effectively only cost you $4,500 because you save $1,500 that would have otherwise gone to the IRS. There are limits. This year, you can contribute up to $6,000 in an IRA. If you are 50 or older, you can contribute up to $7,000 annually. You do pay income taxes on the amounts you withdraw from your Traditional IRA in retirement. It's important to not withdraw the funds before 59 ½ because you will pay a 10% early withdrawal penalty. However, there are some exceptions for hardship withdrawals. In order to see the true impact an IRA could make, I compared two of my friends' savings strategies. In the first strategy, "IRA Ivan" used an IRA to save pre-tax $6,000 each year from age 30-49 and $7,000 from age 50-70. For purposes of making an apples-to-apples comparison in this example, we are going to assume he earned 7% annually on those contributions during that time. In the second strategy, "Post-tax Peter" saves the same amount of income post-tax. Assuming a 22% tax bracket, that means he saves $4,680 from 30-49 and then $5,460 from 50-70. He earns the same 7% on his investment as Ivan. The result? 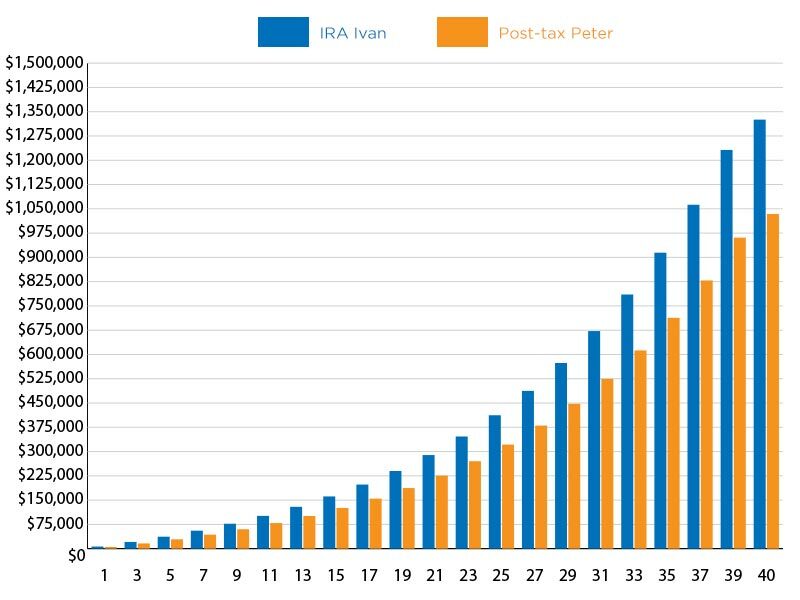 By age 70, Ivan accumulates nearly $300,000 more than Peter. This makes sense given what we know about compounding (see my article on "The Power of Compounding" if you haven't already). Let me help you with your New Year's Resolution. In order to help you get started with that new IRA, I would like to offer you the ability to open an account with no minimum investment as long as you commit to making ongoing monthly deposits for the rest of 2019. Let's make your resolution a reality, one that will pay you back for years to come. The Motley Fool: What is a Pre-Tax Retirement Contribution? U.S. News and World Report: "How to Reduce your Tax Bill by Saving for Retirement"